Fantasy football offers two basic types of drafts: the snake draft and the auction draft. If you’re new to fantasy football or don’t want to make a huge time commitment, you should play in a snake draft league. If you’re an experienced player or just a rabid football fan, you may welcome the challenge of an auction draft. The snake draft is divided into rounds — one round for every available roster spot on each team. For example, if your league has 15-man rosters, your draft will have 15 rounds. In a snake draft, each fantasy coach has one pick in each round. Each team makes its first-round pick based on a predetermined order. When the first round is over, the team that picked last in the first round picks first in the second round — in other words, the draft snakes back on itself. The team that had the first pick in the first round now has the last pick in the second round and the first pick in the third round. 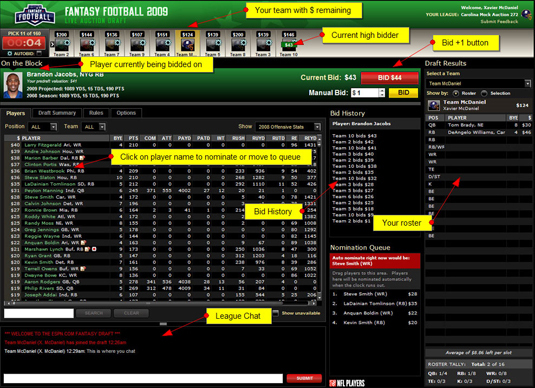 Fantasy football snake drafts are commonly used because they allow for a fair and balanced draft. It would be unfair if the team with the first overall pick was allowed to choose first in each and every round! The key to building a good team in a snake draft is preparing based on your draft position. If you get an earlier pick, you get the chance to draft one of the biggest studs in the NFL. If you have a later pick, you’ll land two top-15 overall players rather than just the one elite player. Either way, you can win a fantasy league by drafting well, regardless of your draft position. 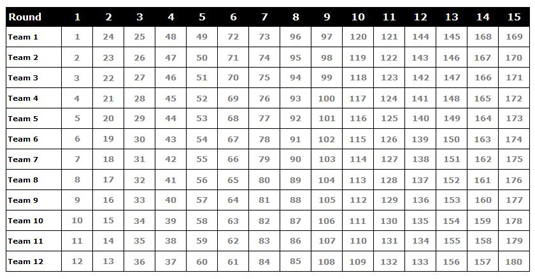 Also, understanding your draft pick number is invaluable to your draft strategy. If you draft at the beginning or end of each round, you will have consecutive picks. This means you need to understand what players and positions are most valuable, because your next pick won’t be for a long time! If you have a pick in the middle of the draft, your picks are more evenly spread out. The following shows what picks you would have in a snake draft with 12 teams and 15 rounds. Note there would be 180 total picks in that draft. Notice how Team 12 picks last in the first round, but first in the second round. This is how the snake draft is conducted. 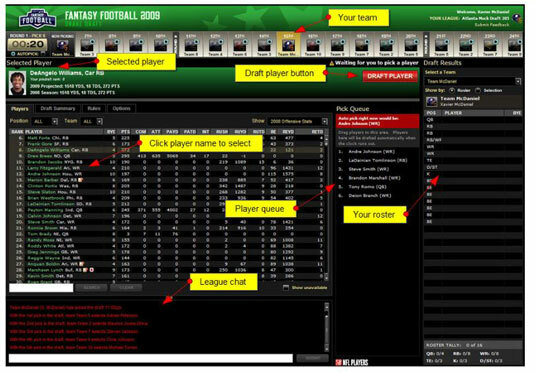 If you know your draft pick number and are in a 12 team league, the table above will tell you the exact pick numbers you have throughout the first 15 rounds. For example, Team 1 would have the following picks: 1, 24, 25, 48, 49, 72, 73, 96, 97, 120, 121, 144, 145, 168, and 169. What is an auction draft? A fantasy auction draft works a lot like an auction on eBay, except that you bid on NFL players rather than antiques or gadgets. In an auction draft, each NFL player is assigned a unit value, and every fantasy team has a unit budget; each team must fill its roster requirements without going over budget. For example, if you have a 20-player roster to fill and a budget of 200 units, the most you could bid for your first player is 181 units, which would leave you with 1 unit per player for the remaining 19 slots. However, doing so would also leave your fantasy team in a lot of trouble! An auction draft still has rounds — the number of rounds mirrors the number of roster spots — but instead of drafting a player when it’s your turn in a round, you place a player on the auction block and start the bidding at an amount of your choice. If no other team outbids you, the player you put up is yours. If another team makes a bid, the bidding continues until no team surpasses the highest current offer; the player is awarded to the highest bidder. Each coach can nominate one player per round; this process continues until all the rosters are filled. Understanding the right value of each player is critical to your auction draft strategy. You also have to be able to predict how other coaches value players. It’s about budgeting. What are you willing to spend to acquire a sleeper who you think has high value? Can you get that player at a cheaper price? All of these questions and considerations need to be thought out so you can build the best team with your unit budget!